A Palestinian prisoner who has been on hunger strike for more than eight weeks is being kept shackled to a hospital bed by the Israeli authorities, despite warnings that he may be close to death. 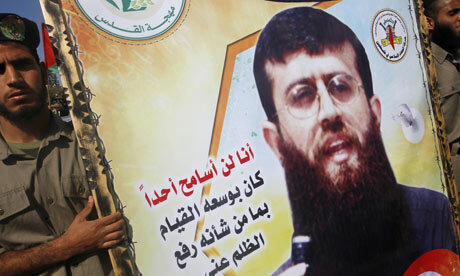 Khader Adnan, 33, has been held without charge under “administrative detention” since mid-December. The Israeli military authorities have refused to tell his lawyer what he is accused of or disclose any evidence against him. Human Rights Watch (HRW) called for Israel to either charge or release Adnan. “He may be approaching death from his hunger strike, and yet Israel is chaining him to his hospital bed without bothering to even charge him with any wrongdoing,” said Sarah Leah Watson, HRW’s Middle East director. HRW cited a 2006 study by the British Medical Association based on a study of the Northern Ireland hunger strikes in 1980 and 1981, in which 10 republican prisoners starved themselves to death. “Death generally occurred between 55 and 75 days,” the BMA said. Bobby Sands, who was elected as a member of the British parliament during the strike, died on the 66th day. Adnan was arrested at 3.30am on 17 December at his home near the West Bank city of Jenin. His wife, Randa, who is expecting the couple’s third child, said no reason was given for his arrest. Adnan was later given an administrative detention order for four months, and is currently being detained in an Israeli hospital in Safed. Adnan has previously been arrested nine times and was convicted of being a spokesman for Islamic Jihad, a militant organisation banned by Israel, his wife told HRW. According to his lawyer, after his arrest Adnan was kept in solitary confinement for four days, and was subject to physical and verbal abuse, threats and prolonged interrogation. His family visited him last week, reporting that he appeared to have lost around a third of his body weight. The family, his lawyer and doctors from Physicians for Human Rights (PHR) all said he was shackled to his bed. According to PHR, he has been transferred to five different hospitals over an eight-day period. A protest over Adnan’s detention and in solidarity with his hunger strike at the Ofer military court and prison near Jerusalem on Saturday was met with teargas and rubber bullets fired by Israeli border police. Sixteen people were injured by rubber bullets. More than 300 Palestinians are being held by Israel under administrative detention orders, according to Addameer, a Palestinian prisoners’ support group. The Nightmare that is Israel cannot go on forever. what people should watch and read instead of BBC and FOX..